Many of our readers have trained in (or at least, have a love for) the martial arts. While Martial Arts is often seen as referring only to oriental martial arts (ie kungfu, karate, tae kwan do, muay thai), it is actually a much broader concept that can refer to any form of combat arts, from boxing to krav maga. When a stylist combines various elements of contrasting combat arts, this is popularly referred to as mixed martial arts (MMA) and, with the help of the Ultimate Fighting Championship, has become the second most watched sport in the USA, behind football. 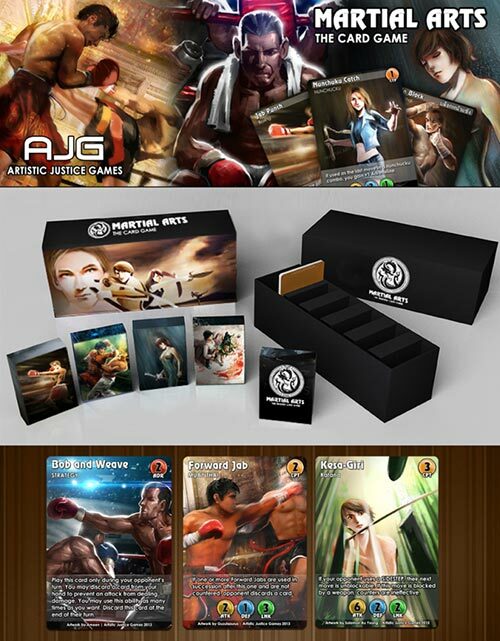 Designer Alex Lim (of Artistic Justice Games)-having been exposed to the Chinese martial arts as a young child through his father-thought there was a place for a card game that used real martial arts to create realistic sparring matches. When his father tragically passed away, the idea of making this game to honor him burned more brightly, leading Lim to a successful Kickstarter campaign for it in 2014. Since then, fellow Indie game company, Green Brier Games-which has a more realized fulfillment pipeline-has partnered with AJA to release this bold game to the public. The idea of mixing and matching martial arts to create a fighting style that is uniquely your own is the principle behind Martial Arts: The Card Game (MA:TCG). To do that, you’ll build a 50 card deck from cards featured in 4 theme decks based on Boxing (USA), Muay Thai (Thailand), Jeet Kun Do (China), and Karate/Aikido/Kendo (Japan), as well as from a specialty deck with cards that include weaponless styles from Tai Chi to Sambo, and weapon-based styles from Butterfly Swords to Rapiers. I had a chance to test out this game system at Gen Con last year and was really impressed with it. But any game can impress in a demo, so how does it live up to a full on review with hours and hours of playtesting? While there are a few weaknesses that didn’t present themselves in the original demo I played, the solutions are pretty simple and, now, I’m even more confidant in giving it my recommendation with those things in mind! Once you fully understand the rules of the game, the layout of the cards is wonderfully direct and easy to read. Attack Cards – These cards push the offensive and can be chained together for combos, but can also be used to defend (albeit not as strongly as a dedicated defense card). Defense Cards – These cards minimize damage and can permit you to counterattack, chaining a new combo into your opponent. Strategy Cards – These cards give you special abilities associated with adrenaline and must be paid for with earned adrenaline points. Event Cards – These double-edged cards change up the game environment for both parties. 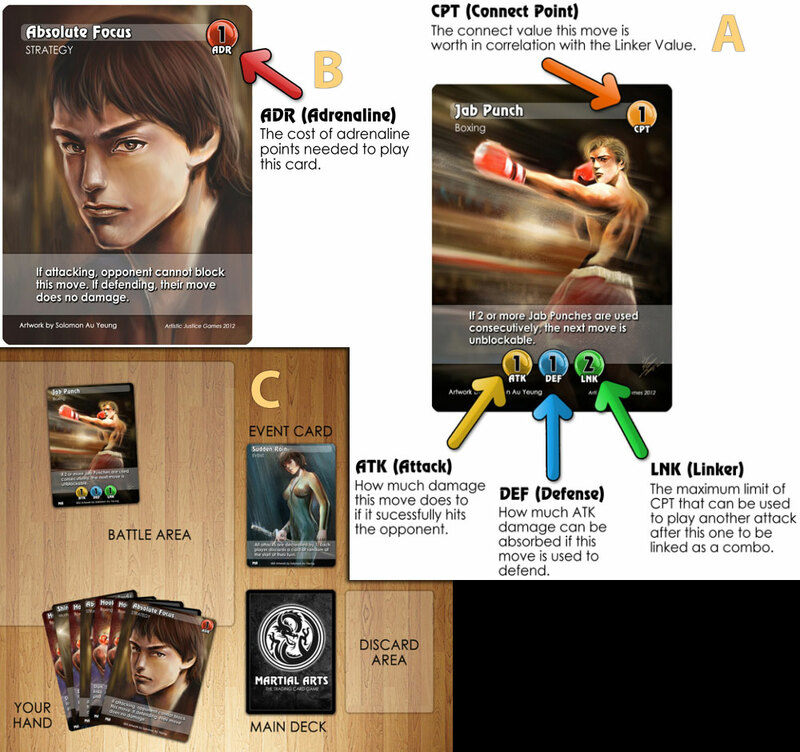 (Counter Clockwise): Attack Cards (A), Defense/Adrenaline Cards (B), and Game Layout Setup (C). The basics of Martial Arts: The Card Game involve each player having a customized 50 card deck and 15 life points. Going back and forth between who is the offensive attacker and who is the defensive blocker, your goal is to deliver enough damage from attacks to lower your opponent’s life to 0. For players to take damage, they must be unable to fully block the damage that is delivered to them from an Attack card with their own Defense card. If they can’t block the attack completely, the attack points (minus the blocker’s defense points) are subtracted from their life. And, if the attacker has planned their attack well, they can chain together cards into a combination of attacks, gaining adrenaline points for each link in the chain. When defenders can successfully block all damage, however, they can turn the tables and combo chains of attacks into their opponent. When you get a chance to play Martial Arts: The Card Game with the most fully realized rule set and a custom built deck of cards, it’s an absolute joy to behold! Fights are aggressive, yet tactical, and games speed by on the right turn or counter to a blow in minutes. I’m not just a game enthusiast that loves strategy games like Magic: the Gathering; I’m also a black belt in in Okinawan Karate. Both parts of my mind have found this game enthralling. Fortunately, there are some pretty simple fixes to most of these problems, such as only permitting counterattacks to occur if you’ve fully blocked the attack damage of an opponent first. (And not permitting the attacker to keep attacking if he’s been fully blocked.) Other strange issues-like Strategy Cards only able to be played at certain times in a round, rather than whenever you have enough Adrenaline or a weird “wait-a-turn-and-reshuffle-your-discard-deck-back-in-if-you-run-out-of-cards” rule-are similarly easily dealt with by an add-on to the rules. For the future, I’d love to see some actively balanced MMA dual sparring decks that are designed to fight well against each other. (The theme decks that have been included are more like an arsenal of different attacks and blocks from different styles, but they rarely play well against each other right out of the box-and, surprisingly, actually include four too many cards to be legal to play with. Having a couple of finely tuned pre-built and ready-to-play sets that folks can purchase-or, if new content won’t be coming out for this game, at least including some “recipes” for making cool custom decks from this kit that fans could download and contribute to on their official site-would be a great way to make it much easier for new players to get into this great world! 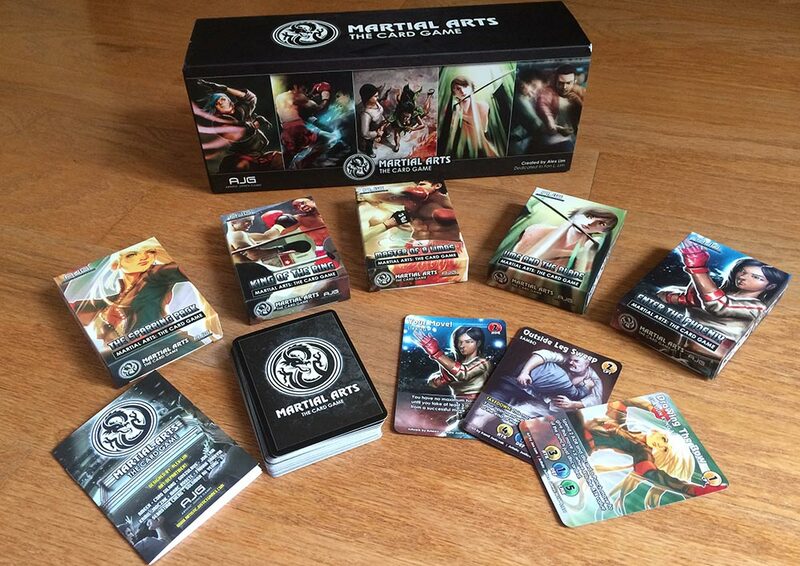 The beautiful cards in this game take you on a tour of many different styles of martial arts. Few cultures have more reverence for Martial Arts than the Gothic community, as many of us have found it to be a salvation of sorts from the problems of our lives-giving us the self-awareness and skills to stay safe in a dangerous world, a way to safely channel the chaotic and artistic impulses many of us struggle with, and a timeless perspective on the world that ties well with the Gothic mindset. Martial Arts: The Card Game takes all of the appropriate reverence for the martial arts we love and then makes it so that you can experience it in a new fashion with friends who may not even be trained in the martial arts. Moreover, it gives players a method to deconstruct and explore the martial arts’ tactics and techniques that would be impossible in any other way. Martial Arts: The Card Game is an incredibly vibrant and exciting game to play. While the rules do need some work, the house rules addon we developed allow the game to be fully enjoyed. Hopefully something like this addon will eventually be added on to the official rules for the game, as well as the option of downloadable card templates to expand your game. I look forward to seeing the new games that Green Brier and Artistic Justice games are working on and featuring them here at DGM in the future! J.T. Hanke is the editor-in-chief of DarkestGoth Magazine. A filmmaker who explores dark concepts, he's also the founder of World of Depleted Creative Community, the postapocalyptic creative project that shares credit and profits throughout the Gothic creative community.